Most people think of photography as a hobby or career; an art form to learn or with which to simply play around. Our minds do not necessarily jump to photography when we think of dentistry. 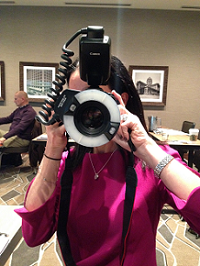 However, digital photography plays a major part in the dental industry. Capturing precise dental images to document the current state of a patient’s teeth is critical in ensuring that the patient’s oral health is where it should be. Dental photography can help to accurately diagnose conditions and prevent further ailments and diseases from occurring. If put on a specific treatment plan by Dr. Jessica T. Emery of Chicago’s Sugar Fix Dental Loft, photographic documentation will show the plan's steps happening right before your eyes. Perhaps you are straightening your teeth using Invisalign or Six Month Smiles. Maybe you are whitening your teeth via implementation of the KöR Whitening Deep Bleaching™ System or Dr. Emery’s Whitening For Life program. Whatever it is, the results will be visible to you and Dr. Emery thanks to photography. The results of cosmetic treatment plans to straighten and whiten your teeth should be photographed. Not only so that Dr. Emery and her staff have amazing images to add to their Smile Gallery, but so that you, the patient, have physical proof that the treatment is working! We know you want proof and we are ready to hand it over. Who doesn’t want to see the changes happen for themselves? It’s much easier to believe the treatment plan is working when you can look at a photo on a computer or camera and see that your teeth are straighter and/or whiter than the last time you had photos taken. In the world of dentistry, digital photos can provide information such as diagnosis of a gummy smile, lip closure path, texture of existing anterior teeth, soft tissue assessment and an overall smile evaluation. Digital photos provide hard-to-see views of the interior oral cavity. Think about it. When is the last time you saw what the upper row of teeth look like inside your mouth? I’m guessing never. I know I haven’t! By using retractors to pull your lips away from your teeth and mirrors to take photos of the upper and lower rows of teeth, dentists are able to snap pictures of what every single tooth looks like and immediately decipher if anything is glaringly wrong. Call Dr. Emery today if thinking about any cosmetic or restorative dental treatment. Sugar Fix Dental Loft is here to help give you the smile of your dreams. Not to mention make sure your oral hygiene health is in its prime. If you choose to proceed with a treatment plan such as porcelain veneers, crowns or simply want to make sure you don’t have gum disease, contact Sugar Fix Dental today and get some digital photos taken.